When I was a student I had a cheap but trusty beast of a tent but some of my friends always bought these super-lightweight, 1-person numbers. It only ever took a few miles of hiking to make me very jealous of them but it wasn't until I did my first solo backpacking trip that I actually invested in one myself. Now, years later, I've tried and tested loads of them and I thought it would be useful for me to shortlist my opinion of best 1 person tents currently available to help others choose from the huge range on offer. Look, this isn't an ultralight option like the Copper Spur UL1, but it is a phenomenal all-rounder at a fantastic price point. I think it's the best 1 person tent on the market because it has the best blend of features without breaking the bank. I love the fact you can just use the fly net for star-gazing and even with the fly on it means you've got great ventilation. Some people say they've experienced some condensation in the mornings but I didn't think it was bad at all; certainly better than many other tents I've tested. As mentioned already it is a bit heavier than some people would like and it's also a bit bulkier than other one man tents. But all this comes down to personal choice. I understand the appeal of shaving ounces and cubic inches from a pack, but the reality is it ain't gonna make or break a trip. The Zephyr is spacious, comfortable and weather-resistant. It comes in at sub-$200. And I think for more people, that's an excellent deal. My only gripe is the floor could be more durable and it doesn't come with a footprint. But you can buy that separately and it's not very expensive (check it out here). Worth considering if you plan on pitching over tough ground or if you just want to extend the life of the tent. This is an awesome choice for backpacking, thru-hiking, bikepacking or any other type of solo camping. It's not going to break the bank or your back. It is going to keep you dry and will last for years. If you need something lighter and higher spec, buy the Big Agnes Copper Spur UL1 instead. (Incidentally, if you're looking for a slightly cheaper option, Alps Mountaineering also do the Lynx 1. You can read my review here or check it out on Amazon here. It's a nice tent if the Zephyr is out of your price range but I think the Zephyr 1 has a nicer design and better build quality so well worth the extra few dollars). The Copper Spur UL1 is widely considered to be the very best one man backpacking tent on the market. This is in large part because of Big Anges dedicating themselves to providing kit that is extremely light and packable without compromising on comfort. The result is you get a helluva space at the same time as trimming ounces from your pack. If that sounds too good to be true then you do need to bare in mind that all this comes at a price. This ain't a cheap tent by any stretch of the imagination. But it is beautiful, extremely well designed and could well be the only single person tent you ever need to buy. If you are the sort of person who buys into the old adage of "buy cheap pay twice" and you want to invest in a tent for life, the Copper Spur has to be in the running for your hard-earned dollars. This is a great choice if you're looking for a tent that is extremely lightweight and packs up small whilst also providing a large living space. If you think you're only going to use a tent a couple of times a year, you may want to look at a different option because this is a serious tent that deserves to be in the back country as much as possible! This Ozark Trail 1 manages to be both extremely cheap whilst providing lots of space and a reasonable degree of durability. There is enough room that you might consider it a 1.5 person tent. It is easy to set-up and take-down. And it's far more solid than you might give it credit for given the low, low price point. It is quite heavy for a one man tent (you'll probably notice the weight after hiking a few miles). And it's also bulkier than other solo tents when packed. And look, the presence of an e-port for electricity suggests it's not really intended for much use in the backcountry. However, it is perfectly serviceable. If budget is the only thing holding you back from an awesome backpacking expedition, then all you really need to do is give it a bit of extra waterproofing and away you go! This is a great choice if your looking for a cheap one person tent. If money is the only thing standing between you and a camping trip, just get it! It's very unusual to find a tent that is both ultralight and easy on the wallet but the Geertop 20D achieves both those things! It packs down extremely well. With two doors and two ventilation windows, condensation is absolutely not a problem. And it even has two vestibules, providing more than enough storage for your gear. The flysheet and inner tent can be used separately which is an added bonus. So what's the catch? Well, it doesn't come with poles. 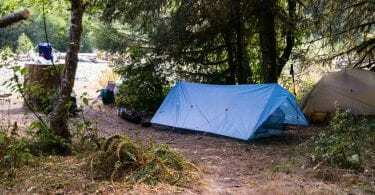 The intention here is to provide a low-cost, ultralight tent for thru-hiking and the designers figured that most people doing that would also carry trekking poles. So to strip away weight, they ditched the tent poles and suggested your trekking poles can be used instead. Pretty smart, eh?! I did have a few niggles. If you're over 6-feet tall you might struggle to fit comfortably. The stakes are pretty standard and given that the tension of the tent really relies on staking it out well, you may want to upgrade to some better ones. And the zippers are flimsy (although if you fashion some zip-pulls out of paracord, that definitely helps). But other than those minor complaints, what you're left with is a very innovative design and a very sturdy, extremely practical, ultralight shelter for a remarkably low cost. If you're looking for a lightweight one man tent suitable for thru-hiking which doesn't break the bank, this is a great choice! You'll definitely need some trekking poles and you can pimp it out a bit by upgrading your tent stakes and some and fashioning some zip pulls from paracord. If you're over 6-foot, you might want to look at a different option (the Snugpak Ionosphere could be a great alternative for you). But for anyone under 6-foot it's really great value, very comfortable and will last a very long time. The Snugpak Ionosphere weighs just 2.5lbs. It's a low profile tent with a single door. The floor space is 8'x3'. The first thing to say about this tent is that it's a firm favourite with military personnel. And they have good reason to like it! It's unobstrusive, lightweight and extremely robust. If you want a small tent that does the job and isn't going to let you down, this is it. You're not going to be able to sit up in it. But there's plenty of room to stow your gear and stretch out. Two people could squeeze in if you were in a tight spot. So that gives you an indication of size. I do know people who've been able to fit their dog in with them without being uncomfortable. If you want a flashy tent, don't even think about buying this one! Everything about it is the opposite of flashy. This is a tent for no-nonsense people. Bikepacking or kayaking? Take a serious look. Scouts? Hunting? Backpacking? Yes, yes and yes. This is a practical tent for practical people. Any sort of multi-night trip, especially moving camp from night to night, would benefit from this piece of kit. Regular readers will know that I don’t always recommend the most obvious gear. This is one example (because the MSR Hubba NX has a better technical spec IMO). But the Luxe Tempo 1 offers a tremendous balance of features at a great price point which is why it tops my list of best 1 person tents. A lot of one man tents can be quite cramped but with the Luxe Tempo you buy yourself a really good amount of space. You can sit up inside and there are two vestibules that will keep all your gear bone-dry. It stands up to most weather, including heavy rainfall and big winds. It’s easy to set up and break down. And it comes with a footprint, which is a nice touch. It’s a bit on the heavy-side as one-person tents go. And the fact it’s a four season tent means that the ventilation may be a bit limiting for summer camping in hot climates. (But hey, you can always flynet!). Other than that, I can't really fault it. If you’re looking for a great all-rounder and you like great value, this is a fantastic choice. It’s not the lightest tent on the market, or the most compact. But it’s well-designed, useful in a range of seasons and environments, and won’t break the bank. Understanding some key components and terminology of tent design will allow you to compare each product with more accuracy. The sleeping capacity of a tent indicates the number of campers that fit inside of the tent with little consideration for gear. In order to keep the weight down, tents fit snugly (especially ultralight models). As there are no industry standards, the actual room in a one person tent can vary with each manufacturer. Tall or stout sleepers will want to pay attention to dimensions as well as square footage to accommodate longer layouts or more elbow room. Three-season tents are the more popular choice. They are designed to handle the milder conditions of spring, summer, and fall. They can handle stronger winds, but do not do well with snow loads. They have mesh panels to aid in airflow and to keep bugs out. These tents usually have walls that are more vertical to give extra headroom, and they weigh less due to lighter fabric and fewer poles. Four-season tents are designed to handle stronger winds and snow loads. They usually have a lower profile and rounded dome designs that offer less interior space. They have fewer mesh panels and are made from heavier fabric that offers less ventilation. They will use more poles in order to offer a more sturdy design. All of this added protection comes at the price of more weight. Traditional thought would suggest that heavier weight equates to sturdier construction, but that is not the case with today’s designs and materials. 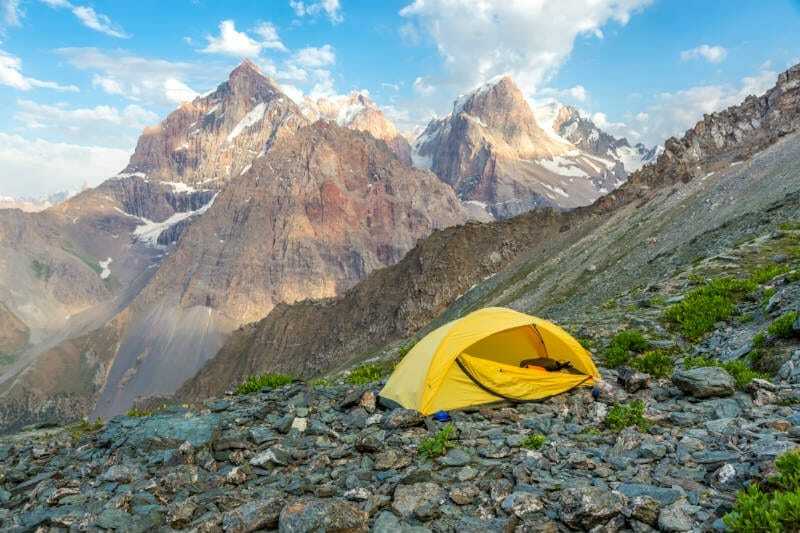 You will want to look for a tent that weighs less than five pounds while hiking, and most modern tents weigh less than three pounds while offering comfort and space. The selection that you make will give you a chance to lower the overall weight carried. Attention should be paid when looking at the advertised tent weight, as they are often listed as packaged weight or trail weight (or both). The packaged weight takes all of the components into consideration. This includes body, instructions, poles, pole bag, rainfly, stakes, tent sack, and more. The trail weight consists of the minimum equipment you will carry to set up the tent. This would include the poles, rainfly, and tent body. The trail weight is usually used in descriptions and may be the best weight to compare this product feature. Today’s tent designs seek to offer more interior space without adding weight. Other features to consider are the location and number of doors, options for sheltered exterior spaces, and ventilation considerations. When you shop online, examine the pitch of the tent walls. Step angles tend to indicate trading less interior space for lighter weight. The length and width measurements can give you an idea of floor size, but tapered designs will offer more width for shoulders and less width for feet in order to save weight. Floor area will give you the square footage of space, and peak height can help determine possible interior room (it should be noted that these measurements can only give a rough estimate, as layouts will vary between products and height measurements are taken from a single point usually). Wall angles are usually a bigger factor for interior space, as more vertical walls can provide more room. Door designs are discussed in detail by many manufacturers, but in the case of a one-man tent, anything beyond a single door is not critical. Ventilation can help prevent the build-up of condensation and vestibules offer exterior storage protection. Another consideration is the materials that the tent is made of. Tent poles will come as aluminum (which are strong and light), carbon fiber (very light and strong, but not as durable), and fiberglass (cheaper, heavier, and less durable). Tent fabrics are usually nylons and polyesters and are rated with a denier (D) number. This indicates the material strength, with higher numbers indicating stronger fabrics. Denier will only be important to you if your selections are identical in most other aspects, with seasonal ratings and pole design being of more importance. Don't forget, a one man tent isn't for everyone. 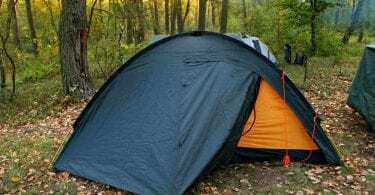 If you are looking for something more social, do check out my articles listing the best 2 person tents and the best 3 person tents. Alternatively, if you want to get even more ultralight, check out my reviews of the best tarps for camping and the best hammock tarps.